Comments: Virginia Rails are similar in appearance to King Rails, but are smaller with shorter necks, gray cheek feathers and reddish legs and bills. 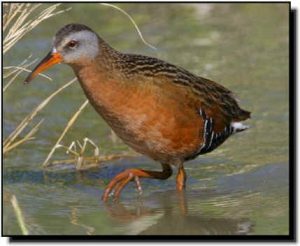 As with other rail species, learning the calls made by Virginia Rails is important in identification as they are rarely seen, but can often be heard in appropriate habitats. One of their calls is described as a wheezy grunting series of wep calls which descend and accelerate. Another is described as a mechanical gik or clattering skew. Virginia Rails are relatively widespread and common in North America and found throughout the Great Plains during the breeding and migration seasons.